Because they are common in our back yard, like this male House Finch we take them as ordinary. They are, perhaps, to someone who has never seen them quite extraordinary. Sometimes it's a good thing to look again. A common visitor to my feeders is this Chipping Sparrow. If you remember that song from the movie Song of the South" you remember. 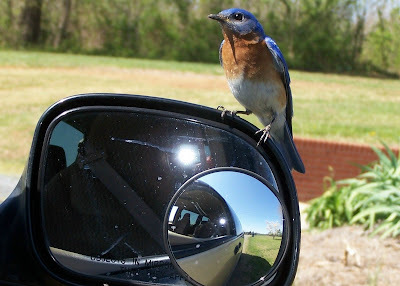 "Mister Bluebird on my shoulder..." Well this Bluebird claimed my mirror as his.